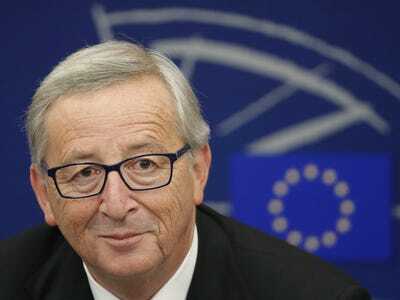 REUTERS/Christian HartmannJean-Claude Juncker’s European Commission will announce its first growth forecasts for European countries on Tuesday. Good morning! Here are the major stories from around the world, ahead of the open in London, Paris, and Frankfurt. The Nikkei Rallied. Japan’s main index of stocks closed up 2.73%, following Friday’s announcement of a boost to QE. In Hong Kong, the Hang Seng is currently down 0.09%. BMW Beat Estimates With A 17% Profit Jump. Demand for the BMW X5 saw BMW earnings rise by more than analysts expected, climbing to €2.26 billion. Sprint Shares Tanked After Disappointing Earnings. The US telecommunications firm reported a loss of $US192 million (€153 million) and said it would lay off 2,000 people. The European Commission’s Growth Estimates Are Coming. At 10 a.m. GMT, the European Commission is releasing its latest estimates for EU growth. At 3 p.m. GMT, factory order numbers from the US are out. Economists are expecting a 0.6% drop in September. Japan’s Electronics Firms Are The Big Winners Of The Booming Nikkei. On Tuesday, Sony jumped 11.05%, Panasonic soared 5.97%, and camera maker Olympus was up 5.36%. Hyundai And Kia Will Be Paying The US Government $US100 Million. The carmakers got slapped with the bill for selling cars with a worse fuel economy than the companies advertised. US Voters Will Be Heading To The Polls. Many organisations are forecasting a 70% chance that the Republican party will retake the Senate. Business Insider’s Brett Logiurato breaks down what that means. The US Department Of Justice Is Investigating JP Morgan. It’s the latest in a long line of banks to be stung by probes over forex trading. JP Morgan is estimating legal costs could run as high as $US5.9 billion (€4.7 billion). South Africa Is Preparing a $US2 Billion (€1.6 billion) Privatisation Programme. In an interview with the Financial Times, finance minister Nhlanhla Nene said that government discussions about a major-part privatisation have begun, but refused to name the companies the country is thinking of selling. Blackstone Is Nearing An $US8 Billion Deal (€6.4 billion) To Sell Its Real Estate Arm. According to Bloomberg, Blackstone is closing in on the sale of IndCor Properties.